Sprint Center, a large multi-purpose indoor arena located in downtown Kansas City, MO, opened back in 2007 and could be the potential new home for either a franchise in the NBA or NHL. This spring and summer, bands and artists coming to the Kansas City area that will play Sprint Center include the following: The Black Keys and The Flaming Lips on April 28; Fleetwood Mac on April 30; Carrie Underwood on May 1; Matchbox Twenty on July 12; One Direction on July 19; New Kids On The Block on July 21; Taylor Swift on August 2 and August 3; Rush on August 4 and Bruno Mars on August 9. Tickets for all concerts as well as all other events at Sprint Center this spring and summer can be found right here at SeatGeek. 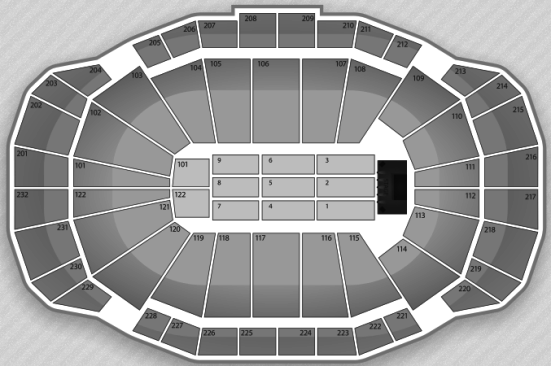 For a look at the seating chart for concerts at Sprint Center, check out the image below. The venue seats 19,252 patrons for concerts.